Contact Us now for FREE Tripping, Inquiries, Sample Computation and Latest Promos. Own the home meant for you. Everything you need is right in every corner of Lancaster New City. Living in a complete community close to school, office, malls, and place of worship. Lancaster New City will help you to start and have your own HOME. Get your own house now! Lancaster New City is PRO-FRIENDS’ flagship project that aims to provide the families with the most important aspects of their lives …to LIVE, LEARN, WORK, PLAY, and WORSHIP. Only a few minutes away from Metro Manila, Filipino families are now SURE they have an opportunity to live in a complete community close to everything they need to raise a happy family. Lancaster New City – Cavite is more than 1,700 hectare English countryside inspired residential community that spans Imus, Kawit and General Trias in progressive Cavite. It is 22 km. away from SM Mall of Asia and Ninoy Aquino International Airport thru Cavite Expressway (CAVITEX) and few minutes travel from Makati and Paranaque. Located in Imus-Genera Trias, Cavite, LANCASTER NEW CITY made shuttle service available for residents in Lancaster New City to go community for a minimal fee. A transport terminal within the Lancaster New City is now operational and caters buses and vans going to Metro Manila, for the convenience of residents and guests. With a commercial complex in the community, residents and guest don’t have to go out of Lancaster New City to buy their basic needs. Do you want to see more of Lancaster New City? Feel free to ask more details and schedule for free site tripping. Start earning your first millions with us.CLICK HERE TO LEARN MORE! 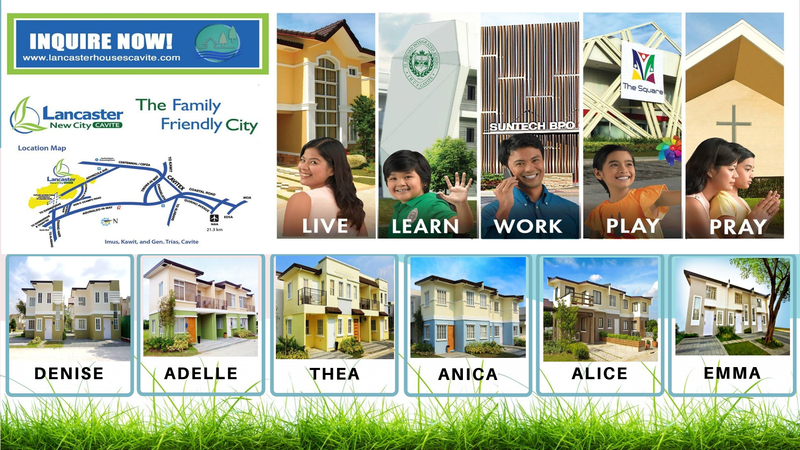 We at Lancaster New City believe that every Filipino family deserves to have a home of their own. We offer affordable house and lots in Cavite that’s only 30mins away from Manila.